Please note that the content of this book primarily consists of articles available from Wikipedia or other free sources online. 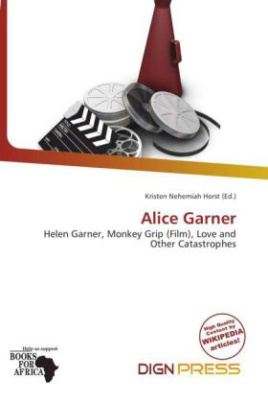 Alice Garner (born 1969) is an Australian actress, musician and historian. She is the daughter of Australian writer Helen Garner and writer and actor Bill Garner. Garner's acting career began as a child in the 1982 film Monkey Grip adapted from her mother's 1977 novel of the same name. She was nominated for an AFI Award for her role. She starred in Love And Other Catastrophes in 1996, winning the Film Critics Circle of Australia award for best supporting actress, and in the ABC TV series SeaChange. In September 2001 she and Kate Atkinson (with whom she had worked on SeaChange) founded Actors for Refugees, to improve community attitudes towards refugees and asylum seekers. She is an occasional Brains Trust member on ABC-TV's The Einstein Factor.